This entry was posted on January 28, 2019 by Chris Elliott. 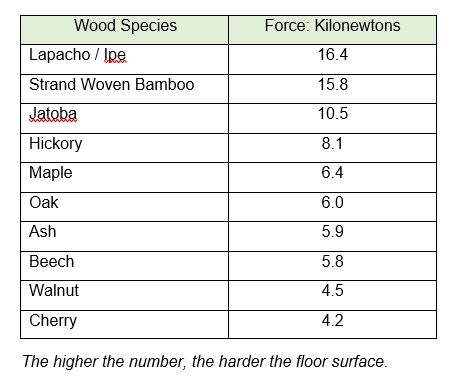 Which species is the hardest wood flooring? For more details about this testing, please see our article: What is the Janka hardness scale for hardwood flooring? Generally speaking, the hardest wood for flooring is Ipe (or Lapacho). However, this is very hard to find, due to its rarity. This also makes it a very expensive flooring product. Therefore, more widely available, and hardwearing are Hickory and Maple flooring. These are commonly found, but can be a slightly higher price and not many options of size or style. They are both slightly harder than Oak flooring. However, Oak flooring is by far the most popular choice of flooring and has a good level of durability. It can be found in many different styles, plank sizes, surface finishes, and at a reasonable price. On the lower end of the Janka scale is Walnut flooring. This is softer than Oak flooring so will need more care and attention to prevent damage. If you are looking for a durable and hard natural floor covering, why not have a look at Strand Woven Bamboo. It ranks highly on the Janka scale and is a fantastic alternative to hardwood. Read our Guide to Strand Woven Bamboo Flooring.